The greenification of the British-era district. 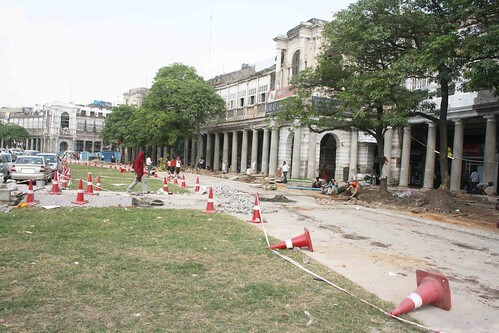 Is this the new look Connaught Place (CP)? 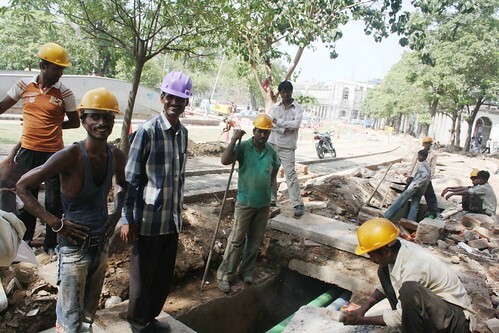 The other day The Delhi Walla was walking in A Block, Inner Circle, expecting to see the usual sights – dug up earth, scaffoldings, barricades and construction labourers. There was all that but there was also saw this green patch of land. 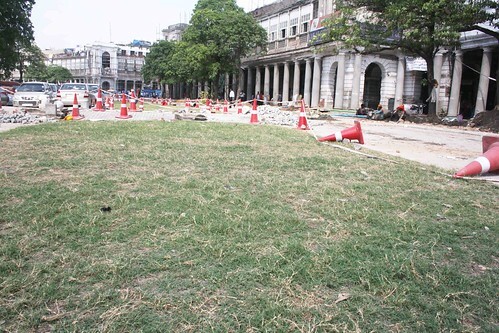 A labourer said that the grass was planted in mid-June. 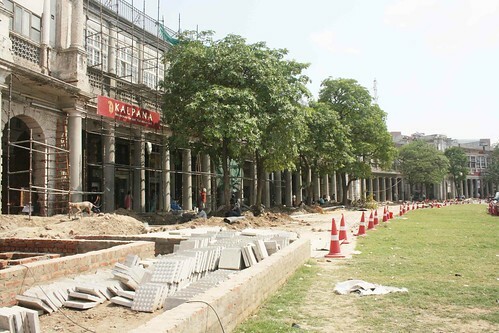 Since 2009, Connaught Place is in the middle of a major renovation, which is being undertaken by New Delhi Municipal Council (NDMC). 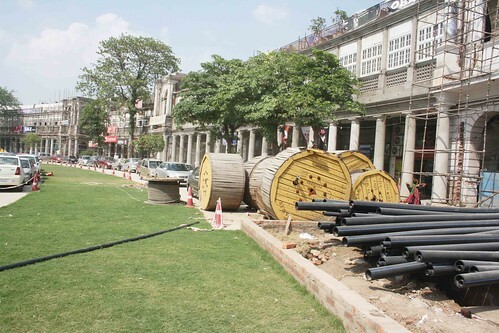 To impress the visitors of 2010 Delhi Commonwealth Games, this British-built commercial district is being made to recapture its earlier grandeur. The old photographs of CP, however, do not show this rim of grass but that is fine. If the entire Inner Circle is ringed green, the Central Park will lose its exclusivity and yet the CP experience will be richer. 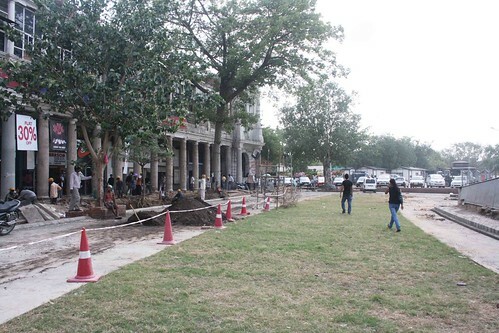 Imagine: shopping, eating, drinking, walking and then lying down on the grass. Perfect. What are the odds of that happening. The grass will be gone before the games are even over. now one may cool one’s sore feet during shopping sprees here on this newly planted turf…and then resume shopping with renewed energy and spirits…it is a welcome change. i was there today.luking gud but kab tak rehta hai? I agree, the grass will probably be gone before we know it. 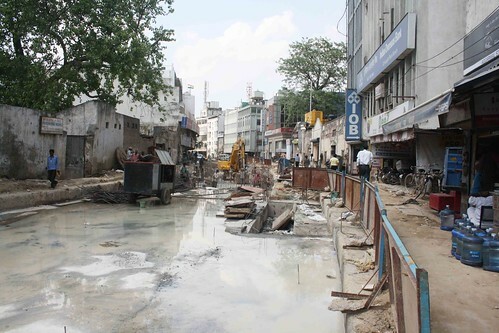 I remember the time when Sonia Gandhi was coming to ribbon-cut the Dhaula Kuan flyover – overnight the authorities beautified the surrounding area, landscaping and what not. After the ribbon-cut and Sonia’s departure, all landscaping was torn apart and dug out so that the… I think it was the sewer line or electricity line (or both) could be laid properly. If only our politicians visited places or work/construction more often.